EL MONTE – Nearly 200 Gidley School students donned elf hats, holiday sweaters and garlands of blinking Christmas lights during the school’s 2018 Winter Sing on Dec. 19, as they sang a selection of seasonal tunes for visiting parents and relatives. This year’s event was the first to feature the school’s Conga Kids members, who danced to “Hit the Road Jack” and “Micaela” and celebrated their first-place win at the District’s Conga Kids semifinal on Dec. 12. 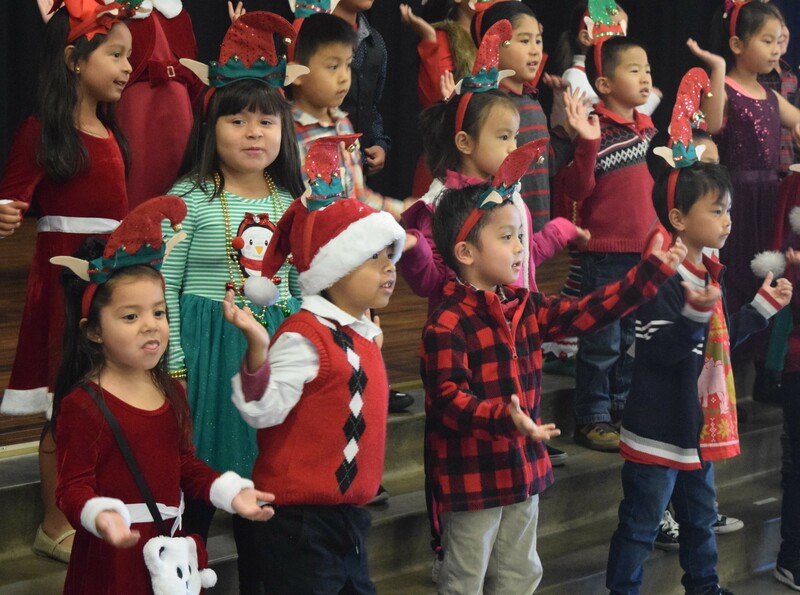 Gidley School has been gearing up for the Winter Sing for a month, TK-6 music teacher Patience Pohjala said. “My favorite part is seeing the kids get excited when they walk into the auditorium and seeing their reaction when they see their parents witness what they’ve been working on,” Pohjala said. Pohjala, who has taught music in the District for three years, said she enjoyed the impressive performance by the Conga Kids students. 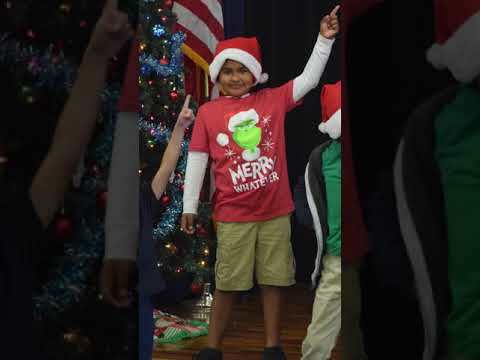 Marquez, who came to watch her kindergartener perform, also said she likes seeing parents and students get into the holiday spirit at the event. EMCSD_WINTER1: Gidley School second-graders perform “I want to Be an Elf” at the school’s annual Winter Sing on Dec. 19. The Winter Sing, which has been a holiday mainstay at Gidley for more than 18 years, featured K-6 and special education students singing holiday favorites for visiting parents and relatives. EMCSD_WINTER2: Nearly 200 Gidley School students fill the school’s auditorium and perform “We Wish You A Merry Christmas” to visiting parents and relatives at the school’s annual Winter Sing on Dec. 19. Nearly 200 Gidley School students fill the school’s auditorium and perform “We Wish You A Merry Christmas” to visiting parents and relatives at the school’s annual Winter Sing on Dec. 19. 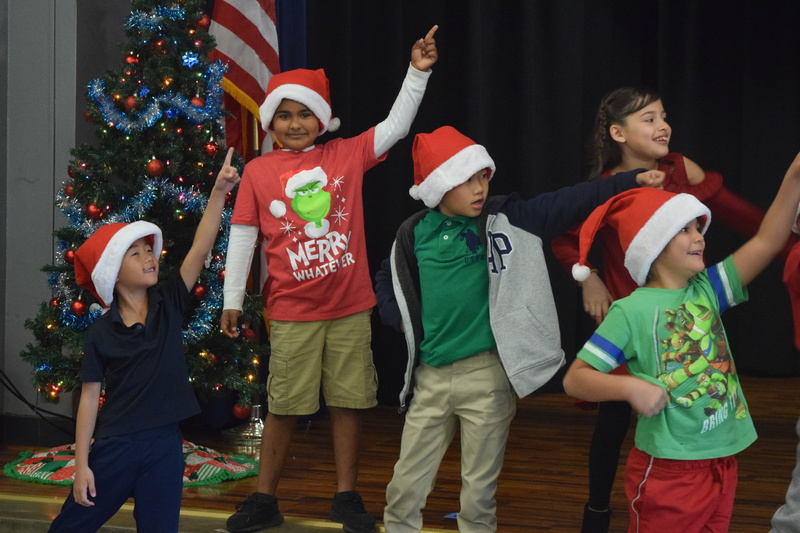 Gidley School second-graders perform “I want to Be an Elf” at the school’s annual Winter Sing on Dec. 19. The Winter Sing, which has been a holiday mainstay at Gidley for more than 18 years, featured K-6 and special education students singing holiday favorites for visiting parents and relatives.